The Hite Art Institute’s M.F.A. program in Studio Art and Design is highly selective in order to allow students generous access to faculty and studios. M.F.A. students receive individual attention and are challenged aesthetically and conceptually. All MFA students receive a scholarship or a teaching assistantship. The 60-credit MFA is rigorous and professional. Drawing from the diverse expertise of an outstanding faculty, students in the MFA program may choose to focus in one medium or explore and combine a variety of media. Courses are offered in ceramics, drawing, fibers, glass, painting, photography, printmaking, sculpture, mixed-media, book arts, and new media. Residing within the College of Arts & Sciences, the MFA program trains students in a multidisciplinary curriculum and challenges them to develop their creative practice in relation to cultural, social, philosophical and ethical concerns. This broad perspective on art and social roles prepares new MFA students to function effectively and meaningfully in the multicultural and global economy. 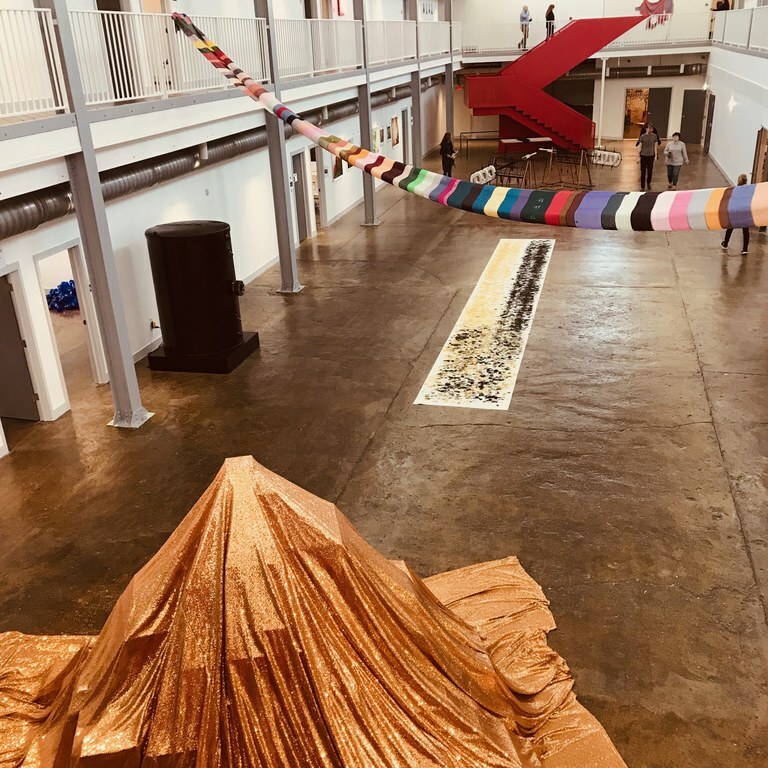 Students in the MFA program interact with Louisville's wider arts community by participating in the university's collaboration with local and regional museums and cultural institutions. Joint projects and internship programs with these organizations strengthen ties between the university and the community and give students unique opportunities to participate in civic life. Application Deadline: January 15 for Fall admission. All applicants must submit an Application for Graduate Admission to the University of Louisville (including a $65 application processing fee, all transcripts, recommendations, and other relevant materials). Link to UofL Graduate Admissions. Questions about the application process? Please contact Theresa Berbet, Academic Coordinator, Senior, at tberbet@louisville.edu. International students must fulfill additional requirements. For further information, visit the University of Louisville Website at http://louisville.edu/graduate/futurestudentsor contact the Office of Graduate Admissions at 502.852.3101. Upon entering the M.F.A. program, the student will select an advisor/mentor with whom he/she will develop a plan of study. In consultation with this mentor, the student will select courses that follow this plan and ensure timely progress toward graduation. The instructor of each course will evaluate the student’s level of achievement and progress in that particular class. Additionally, the student’s progress wiil be reviewed and evaluated in each of the four required seminar courses. Each student’s faculty mentor will, on a regular basis, review the progress of the students they are supervising and provide the information necessary for the Director of Graduate Studies for Studio Art to provide an annual review for SIGS. Upon completion of the first year and a minimum of 18 credit hours, and again upon completion of the second year and a minimum of 36 credit hours, the student will undergo an MFA Review where their progress will be evaluated by a committee comprised of three members of the faculty. The MFA student’s faculty mentor will serve as chair of the committee. Students who receive a favorable evaluation will be allowed to continue in the program and prepare a body of artwork for their thesis exhibition. Students who fail an MFA Review will be reevaluated in the following semester. Students who receive two unsatisfactory evaluations may be recommended for dismissal. Each MFA candidate will work closely with his/her mentor to develop a body of work for thesis and exhibition. During the last semester of study, the student must demonstrate artistic accomplishments through a thesis exhibition, a written thesis, and a final oral exam. The thesis committee will evaluate the student’s achievement and successful completion of the M.F.A program. Satisfactory progress toward the degree requires successfully performing of a number of activities, including regular enrollment in graduate courses, consistent satisfaction of course requirements within given time limits, and maintenance of an appropriate grade point average (minimum 3.0). Katie Ovechkin: fiber and material studies, surface design, mixed media, installation, weaving, social practice and art + activism. Students may select up to three faculty members as their mentor in order of preference (e.g. 1, 2, 3) on the departmental application (via SlideRoom). Applicants are advised to contact the selected faculty member(s) to discuss their artwork and interest in the MFA program. Information about each faculty member can be found on our faculty web page. For admission and scholarship information, contact Theresa Berbet, Academic Coordinator, at tberbet@louisville.edu. For more information about MFA admissions and application, visit: Admission to the MFA Program. Photo album of our Open Studio Weekend 2018: View Facebook album. About our new MFA Studio Building: Grow West: MFA Building.